I'd like to welcome you on this site about 13:20. The frequency of the new time. This pages are about time, synchronicity, 13:20, learning, teaching, understanding, it is about activation. This site has been up for a couple of years however it has been missing some explanation of things as it was initally designed for the few people working with the 13 moon calendar. But suddenly more and more people have been using this application and so it is time to tell you a bit about how it all started and about the true intention of this site. The idea for this project came to me due a lack of a similar project in the world of internet. I was always looking for a comprehensive information about actual Kin. Something like one page you can print out with everything you need to know - kin, oracle, wavespell, poem, etc. And so having programming skills I started working on it. In the beginning of everything was a list of all the years, since the year I was born until 2013, showing what kin was the influence for the year. Kind of a road map or life's journey. Stewing the whole project under a lid end up having heaps of ideas of how to make it better. It is still in the stage of demo despite it all works. I just need to put some more texts around so new people will understand what it is all about. You click on your Kin in the Tzolkin if you know it or you just let me to decode your Kin from your birth date. Following page will show you information about the Kin including, oracle, poem/affirmation, wavespell, earth family members, G-force (all kins in oracle combined) and if date given you will see Dreamspell information about the day (year, moon, week, plasma). It is all interactive so you can click on any glyph to see the information about it. But it is not all. The main feature and the intention of this project is teaching each other about the kins, its energies, properties, qualities, experiences or just observations. It is about sharing our experience of World through 13:20. Let's see how it works. Under all the informations about the Kin is place to enter your comments, observations and experience being the Kin. And so if you feel like you can add your comment to the Kin, Tribe or Tone. The idea is that I can post my comment about being Red Self-existing Dragon. But I might have some significant experience with being a Red Dragon. I can also have some explanation about Self-existing tone no matter if I am a Dragon or not. And so there is a place to put these comments as well. Very soon you will be able to look at all the comments to Magnetic tone from 'Magnetic' people and we will be able to compare their similarities. Same with the Tribes. You might say that there is already heaps of this kind of description on internet. Yes there is. The difference is that it is usually perspective of only one person. The intention of this project is to get as many as people together to contribute to this 'knowledge base' so we can really teach each other and inspire each other. Maybe even convince the doubting ones that there is something on 13:20. 13 moon calendar has been promoted by Foundation for the Law of Time. You will find all about the 13 moon calendar on its website www.lawoftime.org. 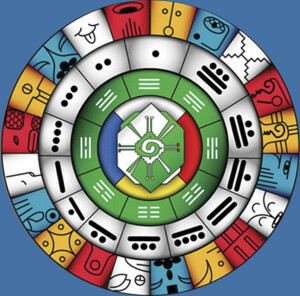 Foundation for the Law of Time is guided by Jose Arguelles who designed the calendar or synchronometr based on Mayan knowledge encoded into their stone carvings. Let's see what Jose Arguelles as an author of many books on this topic has to say about it. And one more to begin with. Jose Arguelles/Valum Votan speaks at the Byron Bay Day Out of Time Celebration 2008, White Lunar Mirror.